Wi-Fi is a remarkable success story. Wi-Fi has been around for decades, and yet it continues to evolve, add new functionality, and improve in performance. Today, it is difficult to imagine what wireless connectivity would be without Wi-Fi. And as we move to 5G, the two technologies will be the main pillars supporting our pervasive connectivity needs of the future. 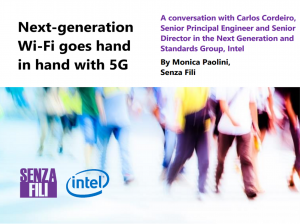 I talked with Carlos Cordeiro, Senior Principal Engineer and Senior Director in the Next Generation and Standards Group at Intel, about the evolution of Wi-Fi and its role in supporting the IMT-2020 vision for the next generation of wireless connectivity.